Due to the success of previous weeks with squid, I decided to give the squid a go early. I caught a small one to put out live without success. 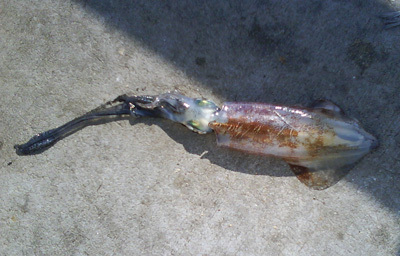 After about half an hour of unsuccessful jigging, I finally managed a decent sized squid. I decided to give up on the jigging and use the fresh squid as bait, cut up in to small rings. The action died down towards high tide. As the tide headed out, the action picked up again with some decent sized snapper taking the baits. One of the baits I put out was getting small nibbles, which I called as pesky snapper. 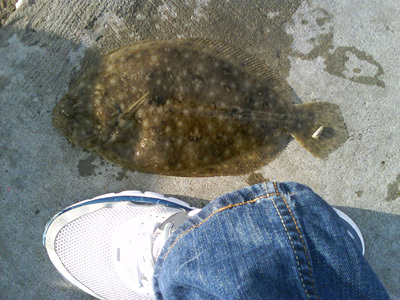 The line remained tense yet but was not moving and after about 10 minutes, I reeled in a dead weight which I thought was a sting ray, but turned out to be a nice flounder! As an aside, I used circle hooks the whole day and all the fish were lip hooked. All the fish were released without harm. I would highly recommend using circle hooks to reduce the damage to the fish.